In 1928, Eric and Mabel Lambert shifted from Wellington to Putauaki, beneath Mt Edgecumbe, a journey of over 500 kilometres. A short time before they left the capital city behind, a polio epidemic had taken one of their sons. Eric had been an accountant for a local timber merchant, though he also supplied town milk. Dairy brought them north. “When they arrived, the whole farm was in manuka and swamp. They brought 10 cows with them. On one side, the neighbour’s development was a bit further ahead, though the fences weren’t, and the neighbour’s cows would walk in to graze happily on our farm,” says the couple’s grandson, Eddie Lambert. “Mabel was a city girl from Wellington, and the story goes that grandad came up first, then grandma followed, coming on the train most of the way, then the last stretch by horse and cart. With the land being just swamp, the cart fell into a mud hole, and Mabel’s best china broke before she even arrived, then they dumped all her possessions on the lawn of the little cottage. It was a very challenging time for her,” says Eddie. Clearing the land was a huge hurdle, and still not totally finished, even today. “In those days, it was all done with a horse and cart, and dray. We still have some native logs under the surface, where the stumps weren’t taken out once it was drained. My grandparents had to carry on dynamiting the stumps out of the ground. As a boy, I remember finding detonators in the workshop and about the farm. It was a thrill to find them, of course, as children weren’t supposed to have them,” he says. Eddie’s parents, Roy and Nan, married in 1948 and, when Eric died in 1962, they took over the farm. “Dad was 10 when his parents first came up here. Although he went to school for a couple of years after that, he had to wake up early to milk the cows, then he was strapped for being late to school because of the milking and, after school, he was kicked up the backside for being late home after having to do detention, so he left school and started working on the farm full-time at age 12,” says Eddie. Roy and Nan raised seven children on the farm, the youngest being Eddie. “It was very physical for them and, as they were brought up through the Depression, they were always conservative as farmers. Farming had to be profitable. You could never borrow money. Only once you made a profit could you buy a new tractor. They were not reliant on debt. “They strictly believed in keeping a nice, neat, tidy farm. Weed control on the hill was one of our weekend jobs. There were never any ragwort or thistles. Running an aesthetically pleasing farm was always a major focus,” says Eddie. Along with his brother, Ken, Eddie went to boarding school in Feilding in the late 1970s. “They had huge oak trees there and, in his last year at school, Ken brought home a bag of acorns and planted them. Now, we have 50 large oak trees in the corners of paddocks and gateways, which was the start of our tree-planting regime,” he says. With their wives, Kath and Debbie, Eddie and brother, Ken, took over the farm from their parents in the early 1980s. Eddie and Kath bought out Ken and Debbie about 10 years later. They reckon they have planted about 20,000 trees on the farm since, including pines, lusitanica, liquidambar, ash and alder. 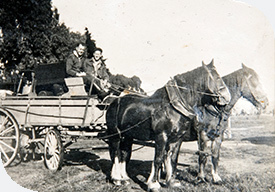 “Kath went to Fieldays 23 years ago, and visited the New Zealand Forestry Association site. She entered a draw and won 200 poplar seedlings, which we planted all over the farm, for shelter and shade,” says Eddie. They have also developed three wetland areas, totalling 10 hectares, including one under a QEII Trust covenant. “We had help from the Bay of Plenty Regional Council. They provided the material, including the trees, posts and fencing, and gave us a planting plan. We had to do all the work, including planting the trees. One time, a truck turned up with 1700 seedlings three weeks before calving. We thought, ‘How the hell are we going to do this?’ We managed to bring in some friends and neighbours and made a working bee of it, though it was a huge amount of work,” says Eddie. They planted pittosporum, kanuka, manuka, smaller natives around the wetlands, and grasses on the edge. “I’m a bit of a tree-hugging greenie. I love to be able to go up the hill and look down on the wetland. Because they gave us the right trees and a good planting plan, it looks really beautiful. We have plenty of ducks and pheasants on the farm, and a big increase in wetland birds. It has been hard work and, even though it was swampy so not ideal for pasture, we did have to lock up part of the farm. However, all that has been more than worth the effort,” says Eddie. Recreating the farm’s wetlands has been a love that the couple has shared, while another has been improving the genetics of their much-admired Friesian herd, which has won them acclaim, and contracts from LIC and CRV. “Good cows are always our goal, and we had one really good cow, born in 1998. We were using the BI system then and, when we had the herd tested, we were told ‘You need to come and look at this cow.’ Her sister turned out just as well, so we went on to breed from those two cows, flushing the cows out, collecting the embryos, and breeding from their daughters and progeny. In 20 years, we reckon we have bred well over 100, maybe as many as 150, direct descendants of those two cows,” says Eddie. After 90 years in the Lambert family, Eddie and Kath have reluctantly decided to sell. With two daughters and two sons, they reckon it would be impossible to pass on the farm in a way that helps one without disadvantaging the other three. Succession planning has taken awhile. “We’ve been talking about it for around eight years. Our children have supported us. They are the ones that are saying, ‘You can’t keep going working as hard as you have. You need to enjoy life,’” says Eddie. They have engaged Phil Goldsmith of PGG Wrightson Real Estate, Whakatane, to market the property, which has 140 hectares freehold, with 80 hectares of transferable leases, a 24-a-side herringbone dairy shed milking up to 450 cows, and produced 209,000 kilograms of milksolids in 2014/15, supplying Open Country. “After three generations of the Lambert family farming this property with heartfelt care, the evidence of their expert husbandry and proud attention to detail is readily apparent. Both the reclaimed wetland areas and the trees they have planted add immense environmental appeal and aesthetic value to a farm that has demonstrated excellent production out of a herd that also shows the meticulously high standards Eddie and Kath adhere to,” says Phil. As an added feature, the Lambert farm is almost adjacent to the planned multi-species geothermal milk processing plant under development by the Poutama Dairy Group, an enterprise comprising six Māori entities from the Eastern Bay of Plenty. Eddie and Kath Lambert’s farm is for sale by tender, with offers closing on 29 March. For more information, see page 25 of our latest publication, Property Express.